Krishnamurti was a frail man; his inherent constitution weakened by childhood illnesses. It was only through the extreme care that he took of his body that he was able to survive into old age. He was meticulous about his diet (he was a lifelong vegetarian) and exercised regularly. The daily practice of yoga kept him supple and lithe. Krishnamurti maintained that for him yoga did not pertain to anything but physical strength and flexibility, and was not a spiritual exercise. It was in this connection that he came to know T.V.K. 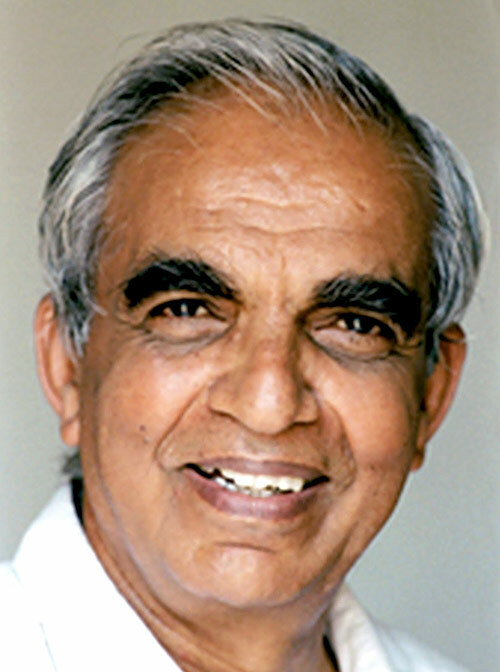 Desikachar, who became a world-renowned yoga master. In the 1960s, teaching yoga was not seen as a serious profession. A turning point in the popularity of yoga was when I started teaching Krishnamurti. I first became aware of Krishnaji in a letter my uncle B.K.S. Iyengar wrote to my father from Switzerland. For my uncle, it was a great event when Krishnaji attended his asana demonstrations in Saanen. My father showed me the letter, but the information had little impact on me. Eventually, however, events brought me very close to Krishnaji. We were to meet year after year, travel together, share thoughts, and chat about mutual friends and all despite, or perhaps because of, the very traditional student-teacher relationship which I maintained with my father the great yoga master and philosopher T. Krishnamacharya. In December of 1965, Alain Naudé, the secretary to Krishnamurti, called on my father at our small flat in Madras. He had a message from Krishnaji. It was a request for my father to visit his residence and demonstrate to Krishnaji how asana and pranayama (yoga postures and breath control) should be practiced. My father readily agreed. On the appointed day, Alain Naudé came to take him to Vasanta Vihar (Krishnamurti Foundation India). My father asked my brother and me to join him. When we arrived, Krishnaji came out with folded hands and thanked my father profusely for the visit. In spite of his 69 years, the postures he demonstrated were of the most advanced nature. My first recollection of Krishnaji is of a gentle, elderly person with a long, flowing shirt and very straight back. He took Krishnamacharya’s hand and led us into his room. Soon he expressed his wish to see how we practised yoga. On my father’s instruction, my brother and I began the demonstration of yoga postures. After some thirty minutes of observation, Krishnaji enthusiastically requested of my father, ‘Sir, I want to learn asanas from you, but you should not be disturbed. Can you send one of your sons?’ I translated this request to my father. My father assured Krishnaji that he would arrange something soon. This first visit in December of 1965 started an association with Krishnaji which was terminated only by his death. The following day when Alain Naudé again called, my father directed me to go to Krishnaji, insisting I should show the greatest respect. When I went to his residence, Vasanta Vihar, there he was on the porch with open arms to welcome me. As he led me to his room, he enquired affectionately about my father as if they had known one another for ages. Before beginning our first lesson, I expressed a desire to see Krishnaji’s yoga practice. He was ready in no time. In spite of his 69 years, the postures he demonstrated were of the most advanced nature—all the variations of headstand, shoulder stand, hand balance, and many difficult back arches. And although his frame was small and the postures varied and stupefying, his chest was as tight as a barrel. I also noticed that his breath was restricted and panting, his hands trembled, his neck was like granite, and his eyes sometimes rolled with tears. Yet his enthusiasm never flagged. I explained to Krishnaji that he must practice postures and breathing exercises that could reduce these problems, and certainly not ones that would increase them. He simply accepted my advice and assured me that he was there to learn whatever I would teach. He also gave me more information about his health. It was obvious that he needed special attention, and clear that I needed guidance in these matters. I took leave, confessing that I would ask my father for direction. Krishnaji was pleased. We agreed to meet the following day. I discussed Krishnaji’s yoga practice and health problems with my father. He felt that Krishnaji should do very simple postures and breathing regimens. He gave me clear instructions, some of which were so unique to my experience that I was taken aback. For example, he wanted me to teach Krishnaji a pose with his legs raised against the wall. Here he should remain doing deep breathing. No more headstand! His neck stiffness was to be corrected by the most simple of head movements. I faithfully carried out my father’s instructions. Krishnaji was so keen to learn that I saw him every day, some days more than once. I was amazed at his remarkable ability to adjust to this new instruction, so contrary was it to the instruction which he had previously received and practised. In a few weeks, there was no trace of previous training. I was amazed at his remarkable ability to adjust to this new instruction. His practice was so regular and punctual that it amazed me. Every day he would be on the porch, right on the dot, to receive me, sometimes with a rose in his hand. I would teach him in the morning for 20 minutes before he gave his talk, and then again in the evening. His place of practice was immaculate. Everything was in its place, right down to his pencil and magazine. He was always eager to understand the significance of what was taught him. Thanks to his probing questions, I was forced to learn more and more about yoga from my teacher. He often would ask me, ‘What is yoga? What is Yoga?’ And the only answer that seemed to have satisfied him was when I defined it as Shanti. [Peace is the equivalent English word.] His attitude towards me was exactly as a student towards his teacher. He would not sit before I did. He would lead me into his room. He would never let me help him to arrange the carpet for his practice. It was not easy for me, in my 27th year, to let this happen, especially when the student was 69 and J. Krishnamurti, but I had no choice. His health began to show signs of improvement. He was so pleased with the improvement in his health that he began to advise those who came to him to practice yoga as well, and yoga became more and more popular in the city. When he left Madras for Rishi Valley, he invited me to join him. Later he invited me to Saanen. He insisted that I must go there to continue our classes and to teach some of his friends. I assured him that I must first consult with my teacher in Madras and would respond. Back in Madras, my father advised me to accept the invitation. But I felt that first my uncle, Shri B.K.S. Iyengar, who for many years had taught both Krishnaji and other friends of Krishnaji’s in Saanen, must approve this arrangement. I wrote to Krishnaji accordingly. Krishnaji met with my uncle in Bombay, and I soon received a positive letter. So while hesitant, I was left with no choice but to accept Krishnaji’s invitation. In June 1966, I went to Saanen where I stayed with Krishnaji in Chalet Tannegg. In a few weeks, my uncle arrived to give his classes. He also stayed in the chalet. Here I was, teaching Krishnaji, while in the same chalet my uncle was teaching his students. And it was here just the previous year that it was he teaching Krishnaji. The potential for tension was real, yet Krishnaji did everything possible to make me at ease in spite of the delicate situation. Thanks to his care my first visit to Europe came off well and nothing happened to strain my relationship with my uncle. Every year for nearly ten years I gave lessons to Krishnaji. I don’t pretend to know what Krishnaji taught by the word, but he taught so much by his example. In January 1985 we met again and he invited me for lunch. I suggested that it was I who should invite him. ‘Maybe I can offer a meal of Vedic Chant?’ He was quick in response, ‘Sir, do it. Do it now.’ I suggested bringing a small group to make it more interesting. We did the chant. He sat attentively through ninety minutes, sometimes chanting with us. At the end of the session, he asked for a specific piece, it was a prayer to Krishna, from Mukunda Mala. In January 1986 I met with him a few days before his sudden departure to the United States. He was his same old self. He enquired about my family and wanted me to take his respects to my father. Spontaneously I made a totally uncharacteristic request, ‘Sir, I ask for your blessings.’ He replied, ‘No sir, we are friends.’ That was the last message he gave me. Krishnaji never accepted the role of guru, but those like me who had the opportunity to teach him something know he was the perfect example of the student. I wonder whether he wanted us to go and do likewise before even seeking a teacher? It is said that the teacher appears only to the earnest student. I don’t pretend to know what Krishnaji taught by the word, but he taught so much by his example: cleanliness, punctuality, dignity of labour, respect for others, humility before the teacher whatever his stature or age, keenness to learn thoroughly, consideration for other cultures. Often it is said that he was not aware of the common man’s problems, but his concern for the poor Indians who are exploited by everyone was overflowing. He was sad when religion exploited the poor. He used to share all those feelings of sadness, which was evident in his eyes. Krishnaji is no more. I, for one, can say he never showed less concern for me than for those who were associated with his following. He was always warning, ‘Sir, don’t become a guru, don’t exploit, don’t become rich.’ Thank you Krishnaji. I will remember you and your advice. When Krishnaji would show me some yoga exercises, I sometimes wondered what his state of mind was while doing them. It seemed as if his whole personality was absent, but at the same time one could feel an enormous presence. Later it occurred to me that he might have been in what he called meditation, a state that he said cannot be brought about by any deliberate action or exercise. Every morning punctually at seven o’clock, we would do the yoga, going through various breathing, eye, neck and shoulder exercises, ending with jogging and jumping on the spot. He was still doing all of this at the age of 89. He was so dynamic and young in his whole attitude, and his energy was that of a young person.